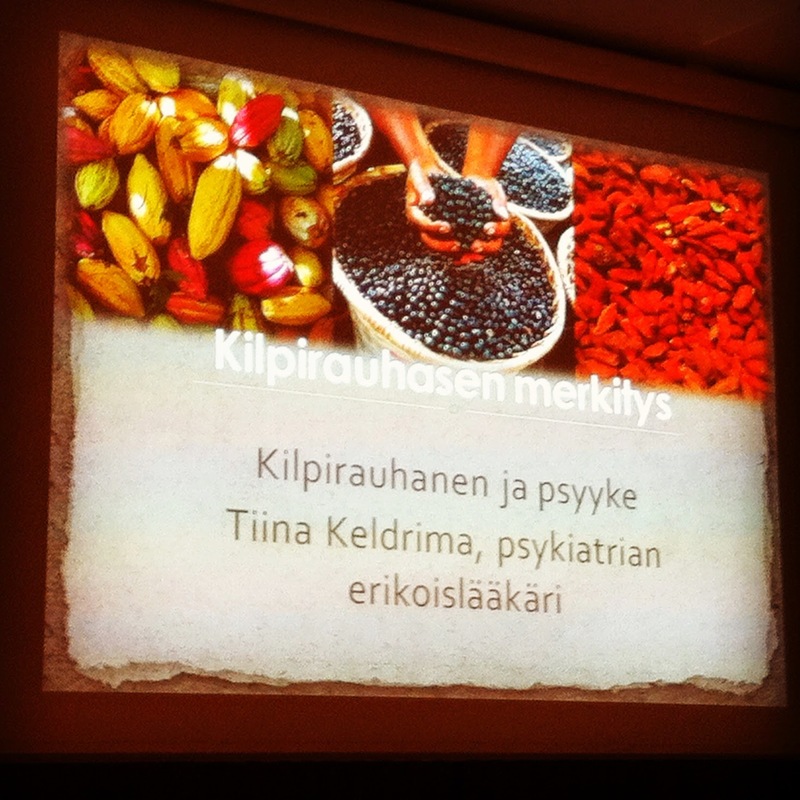 A week ago I joined my friend for a lecture on thyroid and the psyche in Lahti, organized by the Lahti region thyroid organization. Thyroid is right now a hot topic in Finland as doctors are arguing about the use of the T3 hormone, which has even led to restriction of some doctors' right to practice. Some weeks ago there was a short documentary on Finnish TV about the topic where you can hear doctors who are for the use of T3 and the doctors who are against it. 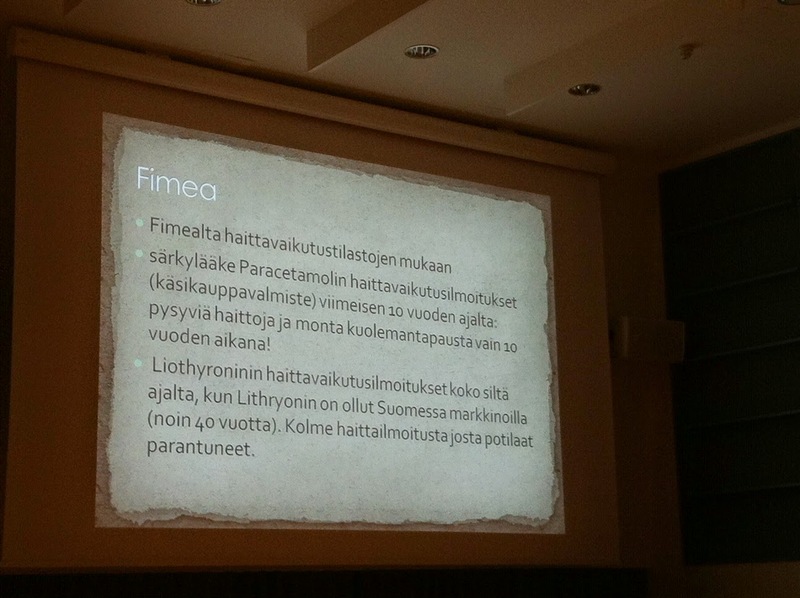 One of the more important points in the documentary, according to me, was made by the representative from FIMEA (Finnish Medicines Agency) who states that T3 hormone is no harm to a human in the right doses as it naturally occurs in our bodies. 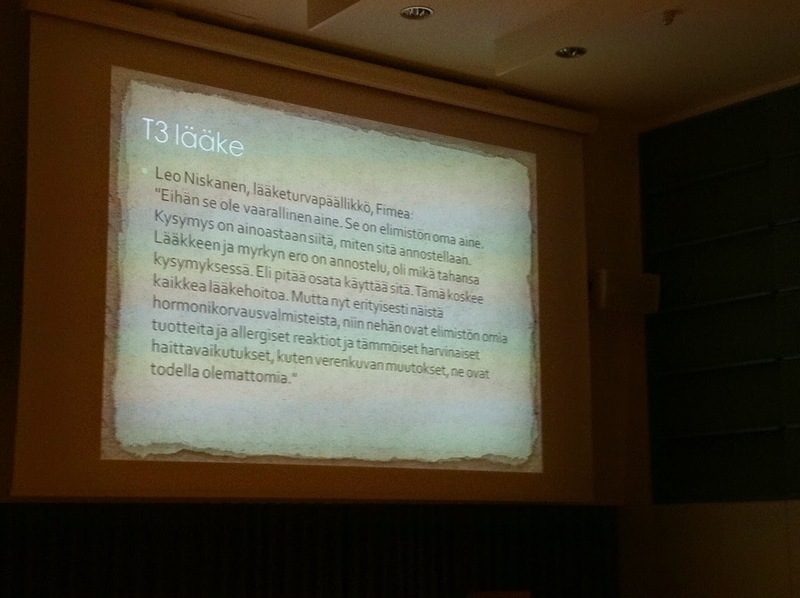 All in all, as Valvira (the Finnish National Supervisory Authority for Welfare and Health) now has restricted some doctors' thyroid treatment no doctor in Finland is willing to give out T3 hormone to patients, which has put a lot of patients who have been treated with T3 in a small panic state. Probably because of all this the lecture last week was overflown with people and they couldn't even let everybody in, however, if you are interested in the subject they are planning a new lecture shortly. The connection between depression like symptoms and thyroid malfunction and how to distinguish a normal depression from one that is caused by thyroid malfunction. How to treat a patient well by actually listening (if the mental health doesn't improve even after getting treatment (psychotherapy and pills) perhaps it is worth investigating other causes? she also included gluten to the list as the use of gluten has increased in our food products and gluten might worsen some psychiatric deceases. 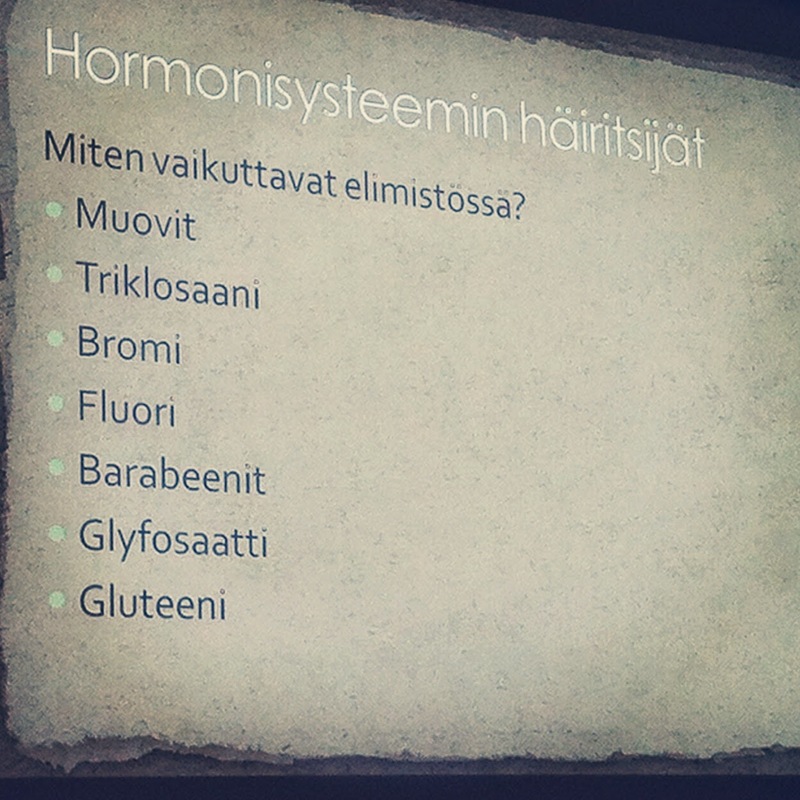 The lecture continued with Erkki Palviainen from Voimaruoka who talked about superfoods and how to eat to get all of the important conerstones into our system. He pointed out among other things that we are small ecosystems so it makes sense to eat accordingly (avoid chemicals and eat healthy, naturally rich food). -all "new food" products that often include a lot of questionable ingredients. 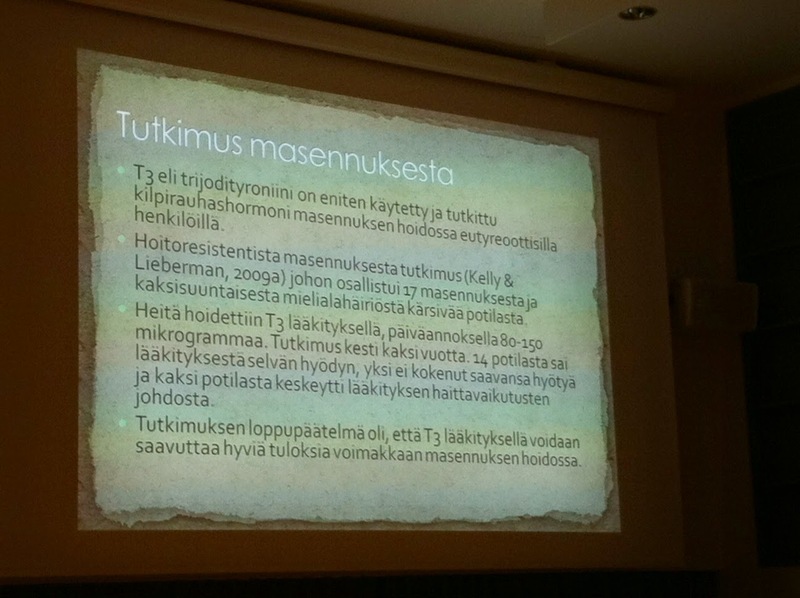 Instead Erkki suggested we should eat natural foods that our grandmothers ate and include into that diet some superfoods like seaweed (sprirulina is a powder out of seaweed) for extra nutrition. If you are interested in learning more about Erkki's life philosophy he recently written a book about Superfood (in Finnish) I haven't read it myself but during the weekend I had a conversation with an acquaintance and it turns out she is reading it right now, so I can guarantee you the book is a good conversation starter at least.